The Stepford wives could never be called feisty, but they do keep nice homes. They wax and vacuum, and clean and dust all day long and late into the evenings, but they never complain. They are rather pleasing to look at too these Stepford ladies. They are round and shapely in all the right places and in many ways they are model wives. When the Eberharts move to Stepford Joanna finds it hard to settle in the town. She finds the town’s women too weird. Not one of them ever seems to have time to pop over for a cup of coffee. They are too busy keeping house. They do find time to go out every once in a while though, to do the shopping, and even that is done neatly; every item is perfectly stacked in their trolleys. Fortunately Joanna does manage to find a couple of friends who are normal. In fact one of them, Bobbie, is refreshingly slob-like. The other one, Charmaine, exudes elegance and is obsessed with tennis. She even has her own court in the garden, so things are not, perhaps, that bad in Stepford after all. Or so it seems. But when Charmaine suddenly sacks her maid, and dons the pinny herself, Joanna is shocked. And when she discovers that her tennis buddy is ripping up her tennis court so that her husband can have his own putting green, Joanna realizes—for a fact—that something very strange indeed is going on in Stepford. The Stepford Wives is a much shorter book than I had anticipated. My copy is only 116 pages long, but it achieves a lot in those few pages and bulking out of the story would only have spoiled it. 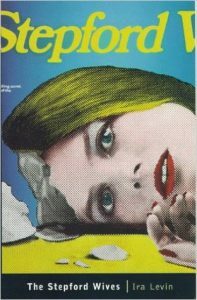 The Stepford Wives is a quietly scary story; the nasty stuff always happens just out of sight. If you have ever watched any really old films, you might remember how scenes sometimes ended with the loving couple closing the bedroom door. What happened next was left to the viewer’s imagination. In a similar way the nasty stuff in The Stepford Wives is left to the reader’s imagination. In the final pages there is a scene where the Stepford men-folk usher Joanna into Bobbie’s kitchen and Bobbie, who really doesn’t seem like Bobbie anymore, and is holding a knife, calls her over to the sink so that she can prove to her that she isn’t a robot. What happens next in that kitchen is left to the reader’s imagination. The horror is not depicted in glorious Technicolor and if the claret flows it flows unseen, but it is still a very scary scene indeed and possibly one of the best scenes in the book.